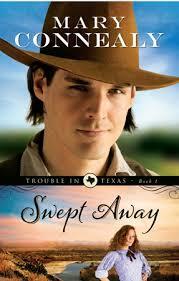 I enjoyed the antics of the Kincaid brothers and their brides so I looked forward to reading Mary Connealy’s latest venture, Swept Away. I was quickly swept into the story as the heroine of the piece. Ruthy McNeil is a scrappy little thing and far tougher than I would be given the challenges she was dealt. For all that she was a trusting soul as well when rescued, after being swept away in a flood, by a total stranger in the handsome package of Luke Stone. Having rescued Ruth, Luke figures the only thing for him to do is take her with him, hoping to find a place for her before he fights for his ranch. They meet up with a band of friends with deep bonds forged in Anderson prison where they served as “Regulators.” There they had been in the difficult position of keeping order, even amongst their fellow prisoners which some saw as traitorous. These men have noble character and willingness to risk all for each other. Ruth comes to respect them and buys into their cause, whether they like it or not. Throw in an abused wife and action bursts forth until they are all swept away. I liked the historical aspect of delving in the bond forged by men in prison during wartime. To deal with death and deprivation as well as the other dangers inherent with desperate men, these men emerged with honor intact and a desire to do what is right above all. The added sub-story of domestic abuse highlights the challenges many women faced in the brutal west. Abuse was not reported and who would interfere with a man’s right to control his wife? These men, however, refused to turn a blind eye and it becomes more important to rescue the victim above claiming the stolen property. There are traces of humor as well in this story. I love that these simple men can have such cute thoughts and Luke tops them all, especially in regards to his new, and unexpected wife. It’s a sweet thing to watch their relationship. I look forward to book two in this series which takes up Glynna’s story. Poor Dare. He’s got it bad. It will be fun to see how this pioneer woman who has been through so much will fire up the local doctor. It will also be fun to see the friendship between Glynna and Ruthie develop.